I don’t know how many of you guys know this but I’m guilty of hoarding so many lipsticks in my vanity. Left on some deserted lane, all I’d care to pack would be few lippies! Although I prefer more of subtle colours, recently I’ve also loved how some weird colours look on me. Few weeks back I went to SmashBox Cosmetics launch in Saket (Delhi) & was spellbound by the shade ‘Chill Zone’. It’s somewhat like a greyish brown which I assumed would look too gothic on me but when I posted it on my Instagram, everyone seems to love it on me. Since then I’ve started adding bold shades to my collection. 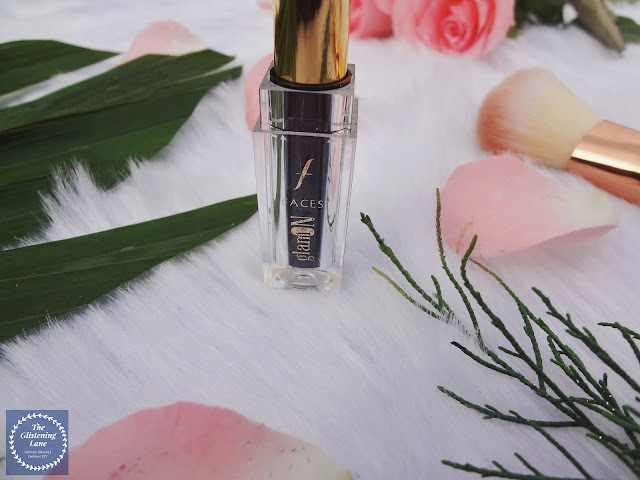 Today I shall be reviewing for you guys the Faces Go Glam lipstick which has been with me since some time but I failed to review it earlier due to hectic schedule of post graduation final semester. 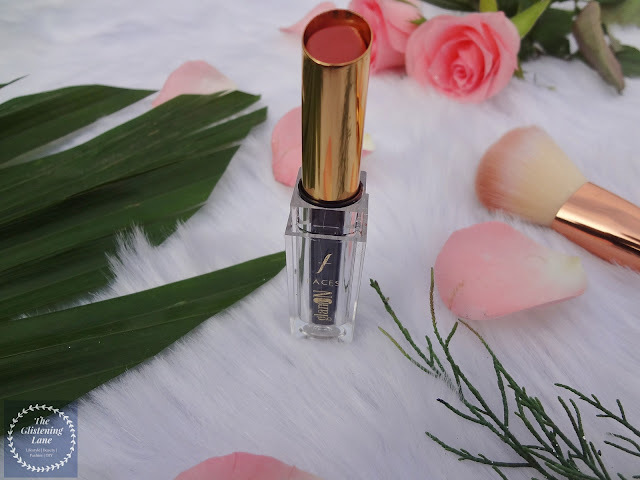 Now that I’m free of University, I decided to sit back and upload this because there’s something about this lipstick which has already paved its way to my heart. So let’s begin without more delays! ▶Paraben free & dermatologically tested. Packaging: The Faces Glam on Lipstick comes in outer packaging of black cuboid box with golden detailing all over it, especially the labelling. Inside, you’d find the lipstick bullet in glass-alike plastic which makes it look extremely fancy. You can see the name written inside again in golden. The cap of the lipstick bullet opens easily and closes with a slight click. I’m not sure if the bullet will survive a fall from great height but then none of them would! It is definitely travel friendly as no sorts of mishappenings ever occurred when I took it to places along with me. Shade: As the name suggests, that is ‘Bare Again’, it is a colour from the nudes’ palette. 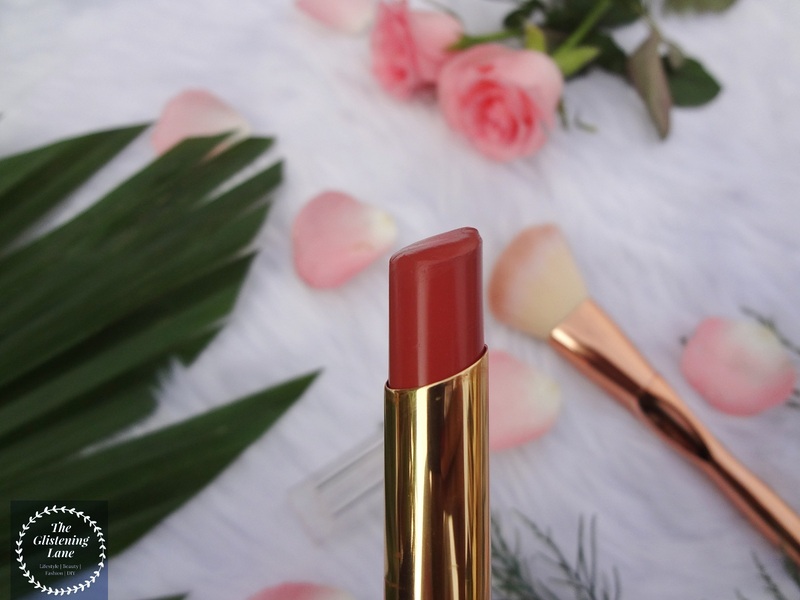 Lately, I’ve developed an inclination for such colours and this one here is a brownish-peach colour and the brown undertones are really subtle. 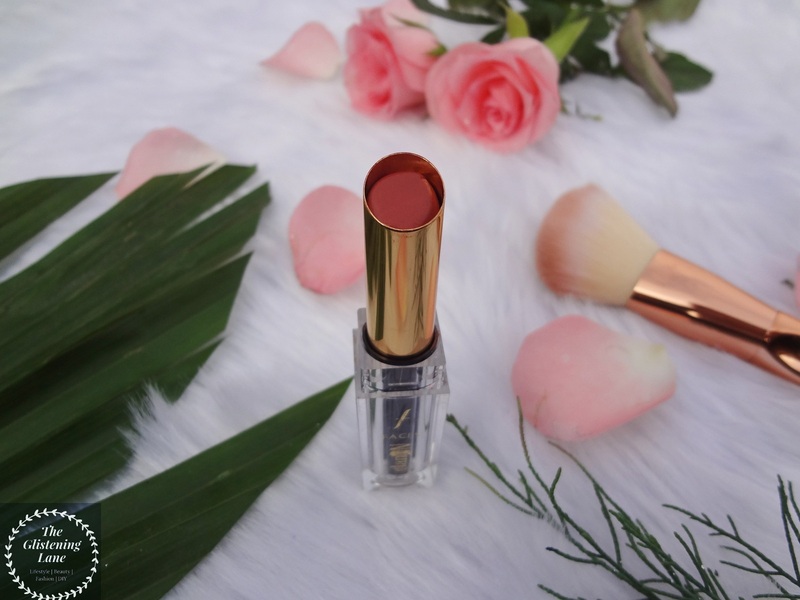 You can rely on this shade for any official events or meetings. Texture: The lipstick glides onto the lips which makes the application pretty much convenient and hassle free. Also it’s pigmented enough so one swipe would be enough. 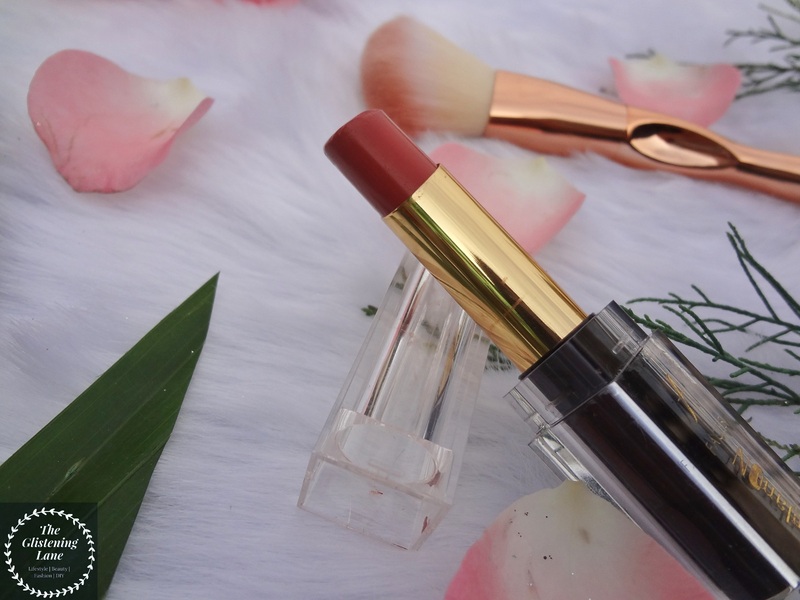 Although the formulation is creamy, you won’t encounter the trouble of broken lipstick which happens with some lipsticks due to their excessive creaminess. Also, the creaminess gradually subsides a little but does not completely evade. It doesn’t give your lips a stretchy feel at all which is its plus point! 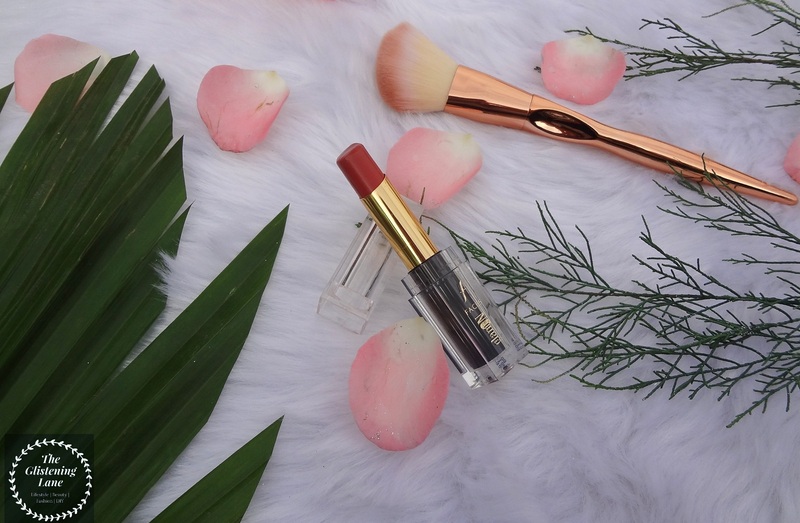 The thing with matte lipstick is you have to devote time before preparing the lips for a matte lip lacquer. But with the Faces Glam On, whence late you can just quickly apply without the need for a lip balm. Longevity: The longevity of this lipstick is 4 to 6 hours but the issue is it isn’t transfer-proof. Thus, most probably you’ll lose the colour before an interval of four hours in case you have a sip of drink/ water or decide to have a meal/snack. With this, you have to keep in mind about re-application. 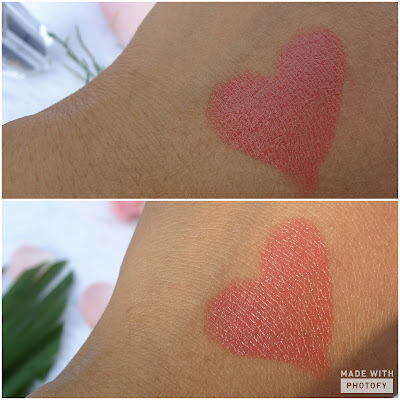 I bought this online without really getting a swatch test done in real and it was more of a gamble because I don’t like to buy my makeup online until and unless I have already tried the product somewhere before. But this gamble was really in my favour! It’s one of the souvenir’s within my vanity which glams up the table wherein it’s kept. Although for summers I prefer my matte formulation anytime but on days when running late or dried up lips, I don’t wanna use matte lacquers and reach back to enriching formulas. 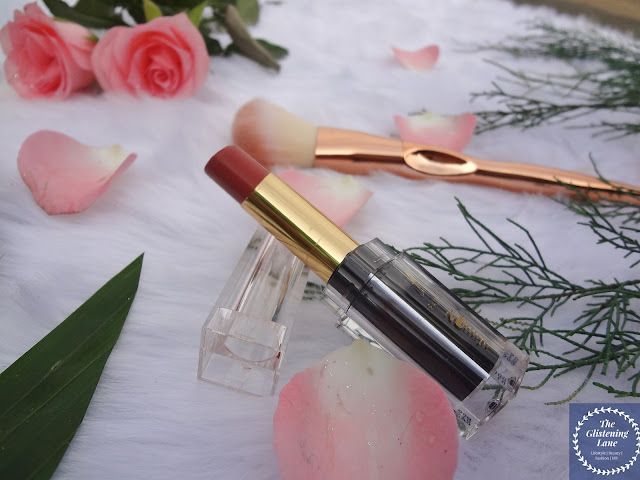 It is one of my go-to-lipcolor on days when I have any formal occasions to attend or for that matter this would completely compliment the smokey eye look. 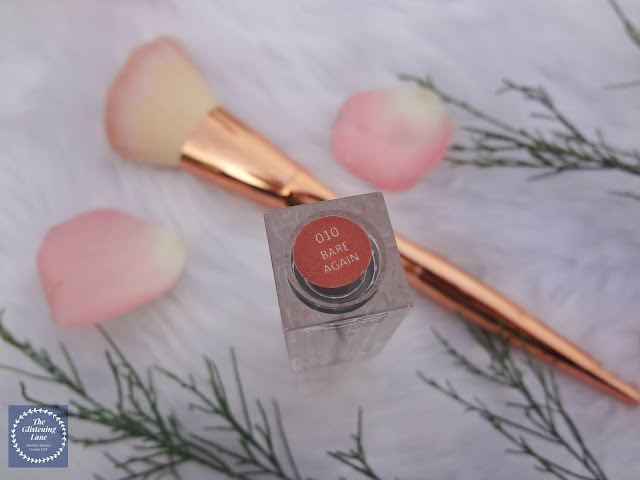 What I love about the shade – ‘Bare Again’ is it’s peachy undertone which is subtly infused with soft brown. 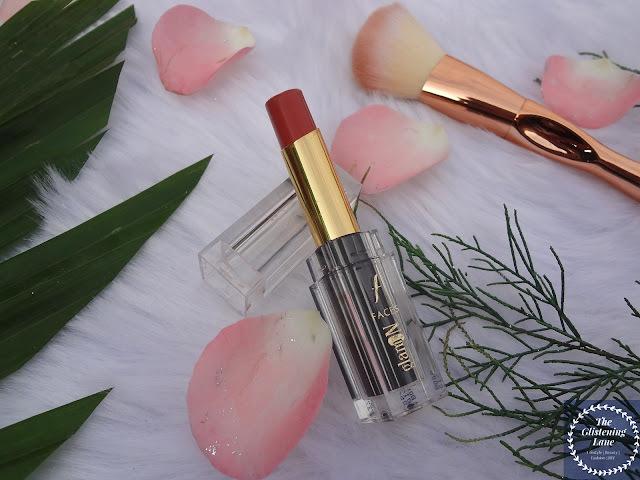 If you’ve been sceptical about peach lipsticks, you can try this! The only thing which bugs me is its fragrance which spells chemical to me. ►Does not settle into lines. 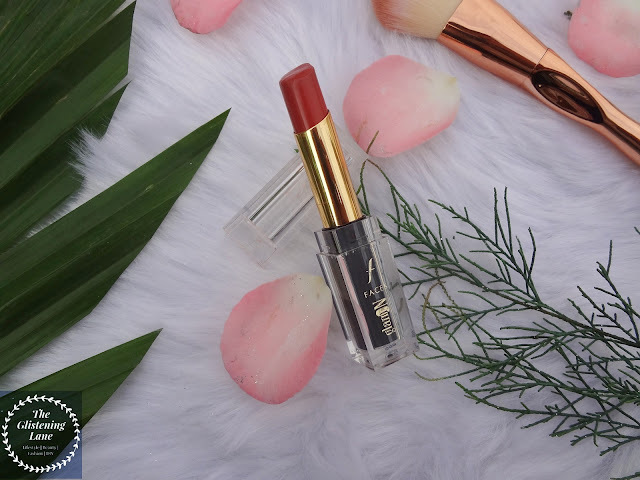 ►Not transfer proof & re-application is a must!